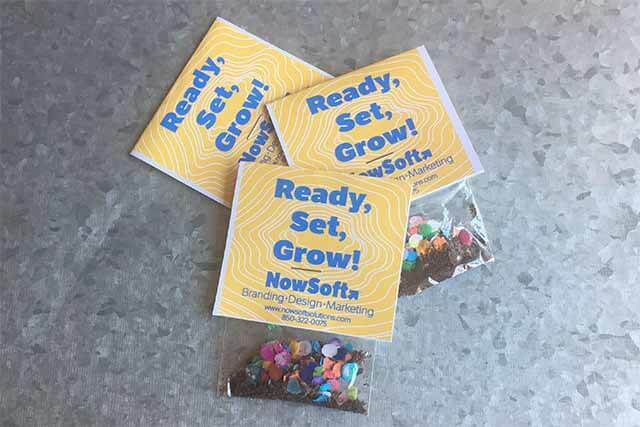 NowSoft Solutions Promotional Products | Trade Show Products. The right promotional products can make a huge impact on your potential customers. We can help you find creative ways to make a big impression, even if you don't have a huge budget. Go beyond business cards with apparel, corporate gifts, giveaways and more, that help you connect with your customers in a whole new way. Pictured above: These are from a promotion we did at a community event held on Earth Day. The bags are filled with biodegradable confetti and wildflower seeds. These made a huge impression on our customers, but the entire order of 500 seed bags was less than $500! We don't usually show off our own promotions this way, but this one is just too awesome to not share it! We think it is a perfect illustration of how to promote your brand without blowing your budget.